Workshop-et Maia janë të hapura për prodhuesit europian emergjentë të filmit, dokumentarit dhe ndër-medias, si dhe për të diplomuarit në manaxhimin e prodhimit audiovizual dhe profesionistë të tjerë të industrisë audiovizive, të cilët dëshirojnë të zhvillojnë njohuritë e tyre. Maia pranon edhe një numë tëlimituar kandidatës nga vende jo-europiane. 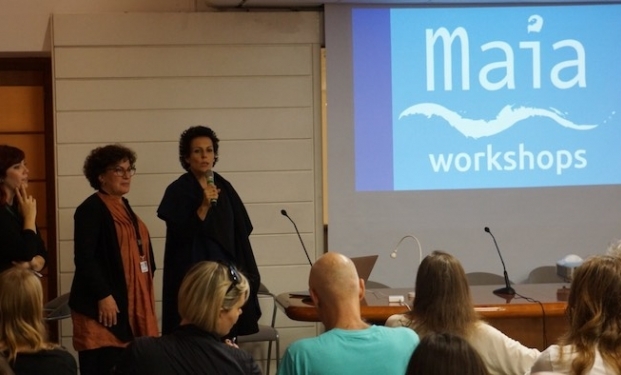 The Maia workshops are targeted to emerging European fiction, documentary and cross-media producers as well as graduates, production managers and other industry professionals wishing to improve their production skills. Maia also accepts a limited number of participants from non-EU countries. You can attend one, two or all three workshops. If you are applying for the 3-workshop package we will ask you to come with a project in development. Single workshops can be attended with or without a project. Each workshop is open to 20 participants and the working language is English. Participation in each workshop costs 1000 € and the fee includes tuition, accommodation and all meals. Following Creative Europe’s regulations a limited number of scholarships covering a maximum of 50% of the fee is available, limitedly for participants coming from countries with low audiovisual capacity. If you apply for the complete programme, the fee is 3000 € for all three workshops. The 3-workshop application entitles the applicant to a place in all three workshops and a close tutorship also on his/her project. – A letter of motivation, including expected benefits from attending the workshop.